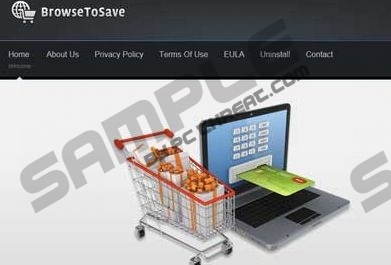 “Browse to Save” or “Browse to Save Ads” refers to a browser add-on which provides the user with various offers and coupons that are available online. They are displayed while the user is browsing online shops, and in order to use the coupon, he or she has to click the preferred coupon. “Browse to Save Ads” are available online as a separate application, for example, at software.informer.com, or it can be bundled with freeware, which is very often installed without paying attention to the information provided in the windows of the installation wizard. As a result, the coupons are also regarded as advertisements. Do not worry if you have accidentally installed “Browse to Save Ads” as you can easily remove it from the computer and your browsers. “Browse to Save Ads” is compatible with three popular browsers Internet Explorer, Google Chrome, and Mozilla Firefox. When the coupons appear, at the bottom of their window you can see the Settings button. It enables you to alter the settings of the application, but if you want to remove it from the PC, you should uninstall “Browse to Save Ads” and then check the settings of browsers to make sure that the browser add-ons are remove from Internet Explorer and other browsers. The next time you launch an installer do not forget that it is important to read the license agreement and the additional information regarding the installation of an extra program. So now follow our removal guide provided below in order to remove “Browse to Save Ads” for good. Note that it is also crucial to provide the computer with the ultimate protection so that you are informed about the potential danger that may be caused by the program you are going to install. Hence we recommend using SpyHunter. Open the Start menu - > Control Panel. Select the unwanted adware application and click the Remove button. Press and hold down the Windows key and press R.
Click Uninstall a program and remove “Browse to Save Ads”. Click Toolbars and Extensions and remove Browser2save Class if it is still presented there. Press Cltr+Shift+A and click Extensions. Point to Tools - > Extensions and remove Browser2save. To scan the system for malware, use our recommended scanner which is available below. If the instructions do not help to remove the adware program, use the full version of SpyHunter. Quick & tested solution for Browse to save Ads removal.